With the arrival of October, it was time for an annual conference in Spain. Unlike last year when I flew over the United States twice, this time I went entirely around the world. On the way, I stopped in Washington D.C. for four days. Timing was perfect to attend the dedication of the Women in Military Service for America (WIMSA) Memorial. 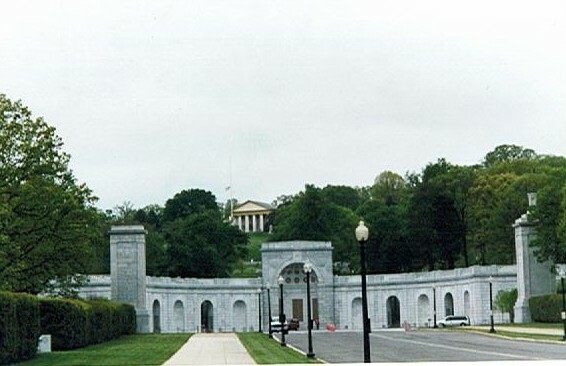 The $24.5 million memorial was carved out of the hillside behind the 65-year-old retaining wall at the entrance to Arlington National Cemetery. $9.5 million of that total came from federal funds to restore the wall, which had been designed as a ceremonial entrance but never completed. 3500 truckloads of dirt were hauled away to create space for an underground exhibit hall and theater. "This isn't just my brother's country, or my husband's country. It's my country as well. And so the war wasn't just their war, it was my war, and I needed to serve in it." One of the features of the memorial is a computerized database of women who have served in the U.S. military since the American Revolution. Although 1.8 million women are eligible, only 250,000 are registered. At my hotel I asked one woman if she was in town for WIMSA. When she said yes, I told her I was, too. "Oh, we're so happy to have you young ones with us." I said I don't often get considered one of the young ones anymore. The first event of the weekend was a formal dinner Thursday night at the D.C. Armory, for which I wore my formal dress uniform. Four thousand people attended, ranging from World War II veterans to corporate sponsors. Performers included Connie Stevens, Loretta Swit and Kathy Mattea. Guest speakers included Sheila Widnall (Secretary of the Air Force) and Tipper Gore. I was introduced to Tipper Gore by retired Air Force Brigadier General Wilma Vaught, the WIMSA president whom I used to work for as a volunteer. I told Mrs. Gore my parents and I had visited her office on day when she wasn't there. She said we could have come in even if she was there--but I don't think her staff would have allowed that. While I waited at the Metro stop to go back to the hotel later that evening, a man asked me, "What are you--like an admiral or something?" "Thats pretty good, isn't it?" I told him, "I think so." An estimated thirty thousand people attended the three-hour dedication ceremony on Saturday. One of the thirteen speakers was 101-year-old Frieda Mae Hardin, a World War I Navy Yeomanette. She was escorted by her 73-year-old son, a retired Navy captain in uniform. He prompted her whenever she had trouble reading her speech. Mrs. Hardin had vowed in 1993 that she would be part of this dedication ceremony. She reminded us that women were not allowed to vote when she joined the Navy. A five-service flyover with female pilots at the controls was planned to conclude the ceremony, but a heavy overcast allowed only the helicopters to fly. Most of the women in the audience were thrilled by the idea of female aviators. The Air Force C-141 had an 11-woman crew, the Coast Guard and Army helicopters were piloted by women, but the Navy and Marine crews consisted of male pilots and female copilots. After my few days of renewing acquaintances, running along familiar trails, and reading The Washington Post, I headed to Spain for the three-day maintenance/supply conference. There we continued some of the discussions started during my visit to Bahrain earlier this year. Leaving Spain, I continued eastward on Iberia Airlines (Spanish). My flight left Madrid at 10:45 Friday morning and arrived in Tokyo the same time Saturday. That included a seven-hour time change, one hour on the ground in Barcelona (when we didnt leave our seats) and almost two hours at the Moscow airport. The inflight movies were American-made, but the language choices were Spanish and Japanese. Being deprived of English really made me feel on the far side of the world. The nine-hour non-stop flight from Moscow to Tokyo completed my around-the-world trip.